TOKYO (Feb 22): Oil prices held near multi-week highs on Wednesday after OPEC signalled optimism over its deal with other producers to curb output to clear a glut that has weighed on markets since 2014. The US West Texas Intermediate April crude contract, the new front-month future, was up 18 US cents at US$54.51 a barrel at 0228 GMT. On Tuesday, the March contract expired up 66 US cents, or 1.2%, at US$54.06, after peaking at US$54.68, the highest since Jan 3. 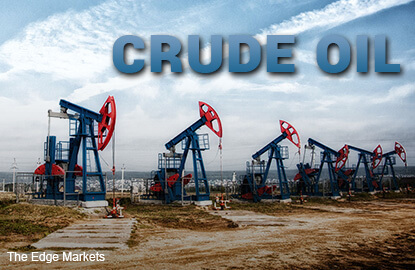 Brent crude was up 24 US cents at US$56.90. On Tuesday, it reached its highest since Feb 2 at US$57.31, before closing at US$56.66, up 0.9%. "We are nearing the top of the trading range for West Texas and Brent and so the next couple of sessions will be crucial from a technical point of view, at least in determining which way we break," said Michael McCarthy, chief market strategist at CMC Markets in Sydney. "The DoE data tomorrow will be where we get our next impetus," he said, referring to the US Department of Energy's official weekly numbers on crude and petroleum product stockpiles. The data is set to be released on Thursday, a day later than normal, following a US public holiday on Monday. Last week's numbers showed US output helped boost crude and gasoline inventories to record highs, amid faltering demand growth for the motor fuel. That has kept a lid on prices after they climbed following an agreement by the Organization of the Petroleum Exporting Countries and other producers to cut output by about 1.8 million barrels per day (bpd). Mohammad Barkindo, OPEC secretary general, told an industry conference in London on Tuesday that January data showed conformity from member countries participating in the output cut had been above 90%. Oil inventories would decline further this year, he added. It was too early to say if the supply cut, which lasts for six months from Jan 1, would need to be extended or deepened at the next OPEC meeting in May, he said.